Become the world's greatest gunslinger in the Wild West when you play the new Microgaming slot at 32Red Casino, complete with respins, wilds, free spins, and more. Saddle a trusty steed, dust off the spurs, and clean those revolvers as Microgaming is taking players on an action-packed adventure to the Wild West where everyone is either drinking, gambling, or shooting for fun. Players will be required to transform into formidable gunslingers to survive in the harsh conditions of the Wild West and search for lucrative rewards and incredible cash prizes during their stay in the western-themed slot called Showdown Saloon. The new Showdown Saloon slot, created by Fortune Factory Studios and Microgaming, is brilliantly presented across 5 wooden reels along with three rows and 15 non-adjustable pay lines. Players will also be greeted by a plethora of thrilling bonus features to make the slot more attractive, including a Mystery Stacks feature, a Free Spin feature, a Re-spin feature, wild symbols, and scatter symbols along with a standard bonus of up to 750 coins available in the base game. 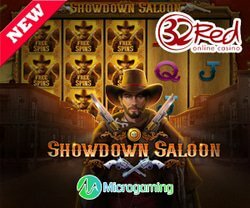 The new Showdown Saloon slot from Microgaming comes with an incredible variety of bonus features that can be triggered either through the desktop version of 32Red Casino or when players download the 32Red Casino software and play on Apple or Android mobile devices. The Royal Flush, presented in front of a green backdrop, will act as the wild icon on the reels and will replicate all standard symbols to hopefully form a win. The gunslinger will represent the scatter icon on the 5x3 reel structure and players will be required to display at least 3 gunslinger scatter symbols to unlock the free spins round. Players will receive 5, 10, or 15 free spins when 3, 4, or 5 gunslinger scatter symbols are displayed on the reels in a single spin. Players can also receive a 2x multiplier during the free spins round when 4 gunslinger scatter symbols are displayed or a 3x multiplier during the free spins round when 5 gunslinger scatter symbols are displayed. Another incredible feature in the new Showdown Saloon slot is the Mystery Stacks feature. On each and every spin, a standard symbol will be selected at random to appear stacked on a particular reel. When players are lucky enough to display Mystery Stack symbols on the middle three reels, they will activate the re-spin feature. Once activated, the Mystery Stack symbol will be locked into place and players will receive one re-spin. If more Mystery Stack symbols are displayed during the re-spin, the new Mystery Stack symbols will convert into the same symbol that triggered the re-spin, providing more re-spin opportunities along with bigger winning possibilities. Even though players will be limited by 15 non-adjustable pay lines in Microgaming's new Showdown Saloon slot, there's still plenty of betting opportunities available on the control panel to ensure everyone can enjoy this western-themed masterpiece. Players can set the reels in motion from $0.20 a spin or go for glory by placing a maximum of $100 on a spin. To further complement the theme of the game, players will be treated to an arsenal of symbols to help with winning combinations in the base game. The whiskey bottle and glasses, revolver, poker chips, and red dice are all high-valued symbols, while the playing cards, from Ace to 10 will be your low-valued symbols. The new Showdown Saloon slot is considered a medium variance game, boasting with a 96.05% payout ratio. The slot is already an extremely popular slot title at Microgaming casinos and you can get a 32Red Casino bonus before venturing into Microgaming's new western-themed slot.